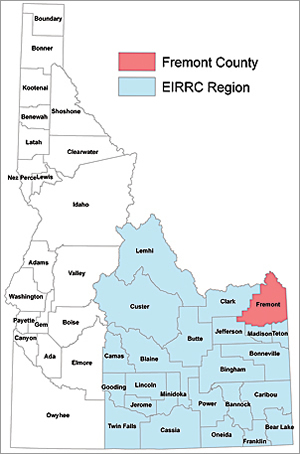 Geographic area of the Eastern Idaho Regional Resource Center. Idaho is largely rural in nature. Boise and its environs are rapidly urbanizing, but there remains a significant amount of farmland, open range, and natural lands surrounding the urban area. Outside this island of urbanity, Idaho's character is rural as far as the eye can see. Small towns dot the landscape, and larger cities (translation: population 50,000) are few and far between. Still, most of the counties in Idaho use GIS as part of their daily operations and employ one or more GIS professionals to staff their operations. As a result, GIS cohorts are scattered hither and yon with little or no daily contact outside of e-mail and phone calls. Idaho's GIS activities have been robust for some time now, yet in the last few years significant efforts have been undertaken to provide better coordination between state agencies, counties, and cities. Idaho now has a geospatial information officer and a geospatial office for coordinating statewide GIS activity. This is helpful when dealing directly with the state, as access to resources and personnel is easier to find. With regard to regional collaboration, the state expanded its efforts by bringing in the consulting firm Croswell-Schulte. This resulted in Idaho being divided into three geographic areas represented by a Regional Resource Center to assist local GIS professionals to collaborate on issues of regional and statewide importance. In 2010, two regions adopted a business plan providing organization, structure, and guidance for improving GIS coordination and collaboration between cities, counties, the private sector, and others. 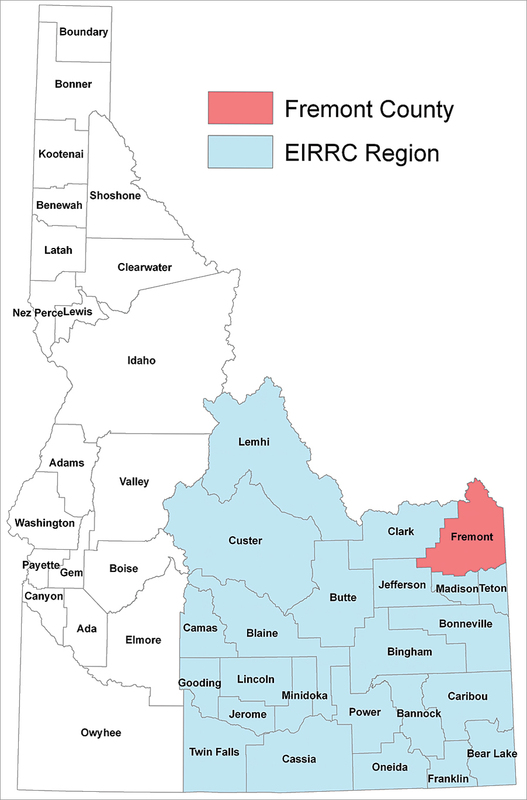 "Regional Resource Centers (RRCs) are organizational components of The Idaho Map (TIM), Idaho's statewide GIS program. RRCs have the primary mission of supporting and coordinating GIS activities and users in specific geographic regions of the state, in coordination with the Idaho Geospatial Council (IGC) and the Idaho Geospatial Office (IGO)." I represent Fremont County, which covers more than 1,800 square miles with a year-round population of just over 13,000. It doesn't get more rural than that. However, it is one of the gateways into Yellowstone National Park, and a large part of the county consists of the Caribou-Targhee National Forest. Fremont County is the most popular fly-fishing location for all Idaho and maintains one of the best snowmobile trail networks in the West. The southern portion of the county is rangeland and farmland with significant harvests of potatoes and barley. Fremont County is very active and faces many challenges, especially at the peak of summer tourist and harvest seasons. Most of the time, I am the only GIS professional working at the county. I try to keep a GIS intern employed, but with semester changes and graduation, there is downtime. Before the recession, Fremont County GIS maintained a staff of four. Now, fiscally challenging times make regional collaboration all the more important. Greg Newkirk, GISP, AICP, is the GIS manager for Fremont County and adjunct faculty for Brigham Young University-Idaho. He has more than 20 years' experience working with GIS.